This Aug. 29, 2013, outburst on Jupiter's moon, Io, represented one of the largest observed on the most volcanically active body in the solar system. Stunning new photos have captured some of the most powerful volcanic eruptions ever observed beyond Earth, revealing a hellish environment on Jupiter's active "pizza moon" Io. 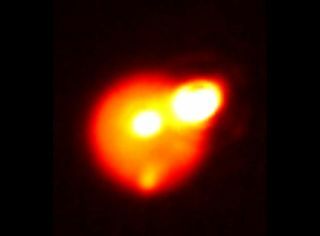 Astronomers imaged three monster eruptions on Jupiter's volcanic moon Io over a two-week span in August 2013, and released the photos Monday (Aug. 4). The frequency of the blasts surprised researchers, who had recorded just 13 giant Io eruptions from 1978 to 2006. At 2,300 miles (3,630 kilometers) wide, Io is about the same size as Earth's moon. In the past, scientists have referred to Io as a "pizza moon" because the volcanoes dotting its surface give it a pockmarked look. Jupiter's moon Io is pictured in images obtained at different infrared wavelengths (in microns, μm, or millionths of a meter) with the W. M. Keck Observatory's 10-meter Keck II telescope on Aug. 15, 2013 (a-c), and the Gemini North telescope on Aug. 29, 2013 (d). Two of the big eruptions occurred on Aug. 15, 2013, while the third — and most powerful — took place on Aug. 29. Researchers spotted and studied the blasts using a variety of instruments in Hawaii, including the Keck II and Gemini North telescopes and NASA's Infrared Telescope Facility. The researchers determined that one of the Aug. 15 outbursts generated lava flows that covered 120 square miles (310 square km), while the other one produced a 50-square-mile (130 square km) flow that was about 30 feet (9 meters) deep. The Aug. 29 blast, meanwhile, was one of the brightest ever observed on Io, scientists said. All three eruptions can be likened to "curtains of fire," NASA officials said, because they likely blasted out of cracks in Io's surface several miles long. Images of Jupiter's moon Io show the evolution of the eruption as it decreased in intensity over 12 days, from Aug. 30 to Sept. 10. "These new events are in a relatively rare class of eruptions on Io because of their size and astonishingly high thermal emission," said study co-author Ashley Davies, ofNASA’s Jet Propulsion Laboratory in Pasadena, California. "The amount of energy being emitted by these eruptions implies lava fountains gushing out of fissures at a very large volume per second, forming lava flows that quickly spread over the surface of Io." While the new observations are helping scientists better understand Io, they should have broader applications as well. After all, extreme volcanism shaped the surfaces of Earth and Venus during the solar system's early days. The two new studies have been accepted for publication in the journal Icarus.